Giffen, Hubert van, ca. 1533-1604. Commentarius D. Huberti Giphanii … in quator libros Institutionum iuris civilis à Iustiniano … [Commentery on the Institutes of Justinian by Hubert van Giffen]. 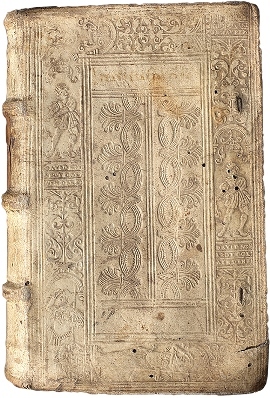 Frankfurt: Sumptibus Lazari Zetzneri bibliopolæ, 1606. This book contains a commentary on the Institutes of Justinian written by Dutch-born German jurist and philologist Hubert van Giffen. The text is printed in black ink on handmade paper and sewn onto split thongs. The book has laced-in wooden boards and is covered in alum-tawed pigskin blind-tooled with decorative rolls and central panel stamps. The stamps show Justice and Lucretia. The curators used different RTI modes to examine the text included in the panel stamps on the front and back of this binding. Both of the modes shown below revealed the texts in fairly clear detail. 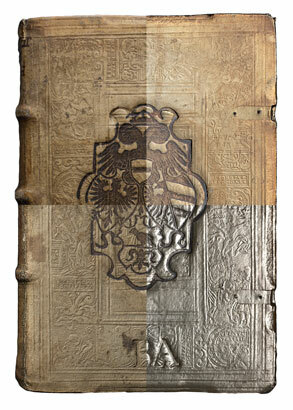 A visual comparison of 16th-century, German alum-tawed bindings in the British Library (BL) database also revealed what appears to be an exact match of both the front and back stamps. The volume in the BL is Antonini Liberalis Transformationum congeries (the Transformations or Metamorphoses) of Ancient Greek grammarian Antoninus Liberalis, printed in Basel in 1568. The book shares almost the same decorative program as the Commentarius, with central panel stamps and a decorative roll of portrait busts (of Protestant reformers such as Erasmus) separated by foliage. The portrait bust roll used on Commentarius lacks identifying names. It is possible that the two books were bound in the same workshop. “Reflections on Bindings: Using New Imaging Technology to Study Historical Bindings,” is on display from February 3 - May 24, 2014, on Level L2 in the Lillian Goldman Law Library, Yale Law School. The curators are Chief Conservator Christine McCarthy and Conservation Assistants Fionnuala Gerrity, Ansley Joe, and Karen Jutzi, Yale University Library. Institutiones imperiales latinogermanicae : die vier bücher Institutionum Keisers Ivstiniani… [The Latin-German Institutes of the Emperor: the four books of Emperor Justinian’s Institutes…]. Cöllen: Erben Johann Quentels vnd Gerwinem Galenium, 1563. 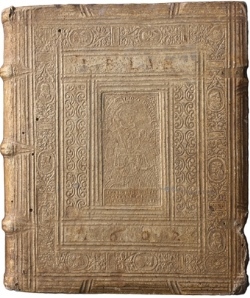 This book contains a parallel text of Emperor Justinian’s Institutes in Latin and German, translated by 16th-century German lawyer Justin Göbler. The text block is printed on handmade paper in black ink, and sewn on split thongs laced into paper boards made with printer’s waste. The book is covered in alum-tawed skin and blind-tooled with decorative rolls. One roll depicts the biblical characters David and Goliath, and the other is a palmette frieze motif commonly used on books of this period. The two images above show an RTI of the palmettes roll (left), and a rubbing of a similar roll (right) found in the Bibliotheque Sainte-Genevieve (DELTA 54853 RES, Thomas à Kempis, Opera Omnia). The image on the left above is an RTI image of the second decorative roll, and on the right are the results of a rubbing of that roll. Using the transcribed text seen in the RTI images of the roll, we were able to find an exact match in Einbandattenbank (EBDB). The text reads DAVID SCHLEGT GOLIATH DEN PHILISTER HAVPTM; “David strikes Goliath, the headman of the Philistines”. –Notes by Fionnuala Gerrity. Translation of the title and stamp text is courtesy of Professor Rebekah Ahrendt, Yale Department of Music. Institutionum : seu elementorum d. Iustiniani … libri quatvor … [Institutes: or elements of Justinian … four volumes…]. Nuremberg: apvd Io. Petreium, 1529. This binding has a decorative roll depicting Biblical scenes which were identified from the text captions. Using RTI images of the bindings, Karen Jutzi transcribed the text and found the biblical passages from which the phrases derived. Fionnuala Gerrity then searched for other decorative tools containing similar text. This book contains the Institutes of Justinian, a 6th-century codification of Roman law, edited by the 16th-century German jurist Gregor Haloander. The text block is printed in black ink, and sewn onto split thongs (the bumps along the spine). The boards are made of wood, which was covered in alum-tawed pigskin and decorated with a blind tooled roll, center panel stamps, and a stamped coat of arms on the front cover. 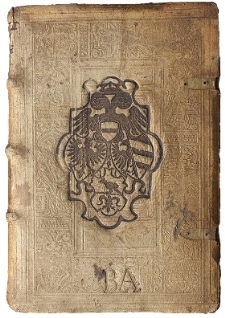 The book was printed in Nuremburg, and the coat of arms stamped on the cover contains the Greater and Lesser coats of arms for the city of Nuremberg underneath the arms of the Holy Roman Empire, with the Austrian State arms in the center. We were unable to identify the coat of arms at the base of design. Examination under a microscope revealed that the coat of arms had once been painted with gold. Ryan Greenwood, our 2013/14 Rare Book Fellow, is the subject of the latest “Bright Young Librarians” feature in the blog of Fine Books & Collections Magazine, “profiling the next generation of special collection librarians and curators.” Ryan discusses his background and his views on special collections librarianship. I think one key is the synergy between digital projects and special collections and rare book librarianship. The huge number of digital projects are varied, useful and appealing for librarians, various other educators and audiences, and they will continue to point back to the physical collections which underlie them. At the same time the easy access and appeal of digital collections challenges rare book and special collections departments to expand outreach and teaching opportunities in new ways, and to promote new digital projects. It’s a complimentary process which pushes libraries outward, and encourages increased collaboration with academic departments and other institutions. New exhibit: "350 Years of Rebellious Lawyering"
In conjunction with the 20th Annual Rebellious Lawyering Conference at the Yale Law School, the Law Library’s Rare Book Collection has a new exhibit, “350 Years of Rebellious Lawyering,” showcasing nine historic examples of public interest lawyering. William Leach. The bribe-takers of jury-men partiall, dishonest, and ignorant discovered and abolished; and, honest, judicious, able, and impartiall restored. London, 1652. Thomas Pearce. 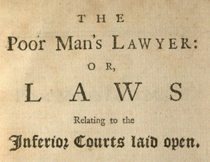 The poor man’s lawyer, or, Laws relating to the inferior courts laid open. London, 1755. “Therefore Gaolers are the Oppressors of the People; and their Fees are Extortion; and that Thief-Catchers, Hussars and Pandours, are a Confederacy of wicked People, chiefly designed to entrap poor unwary People; and are the chief Causes of Hurrying poor abandoned Wretches into their Wiles and Contrivances.” – page 71. Karl von Eckartshausen (1752-1803). Handbuch für Kriminalrichter. Munich, 1792. “The present work deals with historical jurisprudence (early legislation of the ancients as well as Germans and the English) and criminology; included are the theories of Beccaria and von Soden. There is a section dealing with the bad state of prisons.” – Jeffrey D. Mancevice, Inc., August 2008 List, no. 20. Francesco Mario Pagano (1748-1799). Considerazioni di Francesco Mario Pagano sul processo criminale. Milan, 1801. Argument of William H. Seward in defence of William Freeman, on his trial for murder. Auburn, N.Y., 1846. Freeman, an African American, murdered an entire family with an axe. “His trial, and particularly his defense by former Governor William H. Seward, aroused great excitement because of the plea of insanity. … The case did much to insure a better hearing for the insane who, until then, received small consideration in the courts.” (McDade, Annals of Murder). Boston slave riot, and trial of Anthony Burns. Boston, 1854. “The trial and rendition of Anthony Burns was one of the most dramatic and famous incidents in the enforcement of the Fugitive Slave Act” (Finkelman, Slavery in the Courtroom). Several of Boston’s leading lawyers, including Richard Henry Dana, argued unsuccessfully for Burns’ release. After a disastrous attempt to rescue Burns, he was sent back to slavery under heavy military guard. Argument of Clarence Darrow in the case of the Communist Labor Party in the Criminal Court, Chicago. Chicago, 1920. Governor Young: pardon Tom Mooney-innocent. San Francisco, 1930. Tom Mooney (1882-1942), a militant labor organizer, and his colleague Warren Billings were framed on murder charges in 1916. Their death sentences were commuted to life in prison. This pamphlet is part of the decades-long campaign to win their release, which resulted in Mooney’s pardon in 1938. The Law Library has close to 30 items on the Mooney case. Legal Self-Defense Group. Mr. Natural in Bailed out. Boston, 1971? 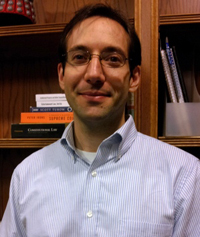 “350 Years of Rebellious Lawyering” was curated by Mike Widener, Rare Book Librarian, and Ryan Greenwood, the 2013/14 Yale Law Library Rare Book Fellow. The exhibit is open to the public, 9am-10pm daily, February 20 - April 30, 2014, on Level L2 in the Lillian Goldman Law Library, Yale Law School. New exhibit: "Reflections on Bindings"
Rare book bindings are fascinating objects, which are often beautifully decorated with intricate images. Reflectance Transformation Imaging (RTI) offers exciting new possibilities for safely capturing a book’s surface decorations, revealing details that cannot be seen using traditional methods or the naked eye. A new exhibit of books treated to these innovative techniques is now on display at the Lillian Goldman Law Library. “Reflections on Bindings: Using New Imaging Technology to Study Historical Bindings,” features books from the Rare Book Collection of the Law Library, which have been analyzed using RTI to show exquisite details from early modern blind-stamped bindings. These details can help us to identify the book’s early owners and understand attitudes about the books within the bindings. The analysis was expertly undertaken by members of Yale University Library’s Conservation & Exhibition Services team, who curated the exhibit. The curators are Chief Conservator Christine McCarthy and Conservation Assistants Fionnuala Gerrity, Ansley Joe, and Karen Jutzi. The exhibit is open to the public, 9am-10pm daily, February 3 - May 24, 2014, on Level L2 in the Lillian Goldman Law Library, Yale Law School. For more information, contact Mike Widener, Rare Book Librarian, at (203) 432-4494 or <mike.widener@yale.edu>. Shown at left is one of the books on display, Institutionum: seu elementorum d. Iustiniani (Nuremberg, 1529).